Participants who have already been through the workshop/seminar once can book a single block at any time. Raizes do Brasil is an advanced workshop project for Brazilian percussion which is unique in Germany. 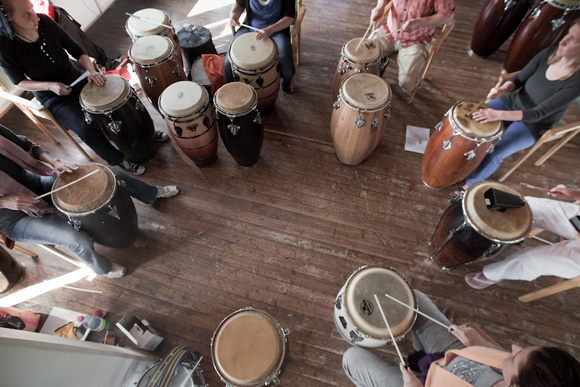 In the last 20 years, hundreds of professional percussionists and accomplished percussion group leaders have laid their personal foundation for a systematic and intensive immersion into the universe of Afro-Brazilian rhythms here. Dudu's authentic relationship with the Afro-Brazilian culture, his continual occupation with new trends and techniques, and his many long years of experience in modern music teaching have, for decades, guaranteed the long-lasting and effective quality of this seminar/workshop. The 19. Raizes do Brazil seminar will be offered in two modules with 4 dates for each, which can also be booked individually. Requirements for the first block (BASICS) are previous experience in the field of percussion or other musical knowledge and skills. Block 2 (ADVANCED) requires participation in Block 1 (BASICS) or extensive experience in percussion. It is also an opportunity for participants who have gone through the entire seminar/workshop in the past and want to refresh and update their skills. 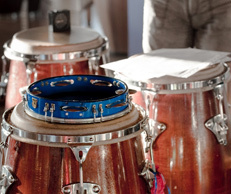 The most important rudiments of Afro-Brazilian rhythms will be taught while deepening the basics of various playing techniques on different instruments. 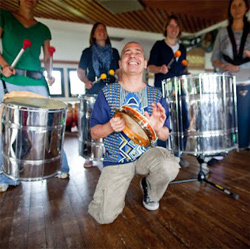 Working together to develop ryhthms for congas, pandeiro and the samba instrumentarium alternates with warm-ups, independency exercises and repeated practice with techniques for certain instruments (tambourine, sticks, pandeiro etc). Throughout the workshop, Dudu will provide detailed information on the historical, social, and spiritual background of the practical work on the instruments. The first four weeks are the basis for the second part of the advanced seminar "Raizes do Brasil". In the second module, "ADVANCED", studies from the first module "BASICS" will be deepened. The practical skills acquired provide a basis for a deeper understanding of the relationships within the many-colored tapestry of Afro-Brazilian rhythms. Dudu will help you to directly experience the relationships between long traditions, most of them never put to writing, and the specific social and regional contexts in modern Brazil and their reception in Europe through an extensive study of rhythms, songs, lyrics, and ensembles. A particular focus hereby will be the spectums of Maracatu, Candomblé Ketu and Candomblé do Angola, which become accessible to us through their underlying philosophies of life. Musical emphasis will be placed on the work with solis and breaks as well as the modification of traditional rhythms for modern or popular music. This seminar is also suitable as a refresher course for those who have already taken part in the previous advanced seminars. The ufaFabrik is a self-managed „culture and life“ project in Berlin's Tempelhof district, and one of the best-known and popular cultural centers of Berlin. With its bed & breakfast accommodations, café, organic food store, and many rehearsal rooms, we have found a wonderful location for our workshop, kindly provided to us by Manni Spaniol. Here, we conveniently have the seminar rooms and accommodation at the same place. The lovely green „Uferpromenade“ (waterside promenade) along the Spree River's „Landwehrkanal“ is nearby, and invites you to relaxing walks during your breaks. It is important for us that participants have good contact to each other and create a positive and energetic group dynamic. This beautiful place, with its long and rich „drumming tradition“, is the perfect location to make it happen. Guest House at the Ufafabrik. We have booked accommodation for the workshop at the Ufafabrik, one of the best known cultural centers in Berlin. The shared rooms there are comfortable, have a lot of light, and shared bathrooms. You can get a good idea of the rooms on the Ufafabrik website. Whoever would like a single or double room can book it themselves on the website. Please let me know about this if you do. It's important for us that a good "group dynamic" develops among the participants, which is why we tried to find a nice place that also has a long "drumming" tradition. But it is no problem if anyone would prefer not to stay at the guest house. Please ask about the costs for the accommodation when you register for the workshop. always Wen 15°°– Sun 1.00 p.m.
A discount of 3% will be given for booking both blocks. This will be settled in the last week.